You will have seen photos, you will have seen documentaries, you may have been taught in school. Some people will be compelled to visit here, some feel they must, but perhaps everyone should do so that the horrors of yesterday never again become today. A place where 1.1 million people, mainly European Jews were systematically dehumanised, tortured, experimented on and murdered. Auschwitz was the largest Nazi German concentration camp and death camp. 40 miles west of Krakow, Auschwitz Birkenau is now a UNESCO world heritage site, a museum, a memorial, with a meaning. Auschwitz gate entrance. Work sets you free. It’s a museum of two parts, from two of the remaining camps. 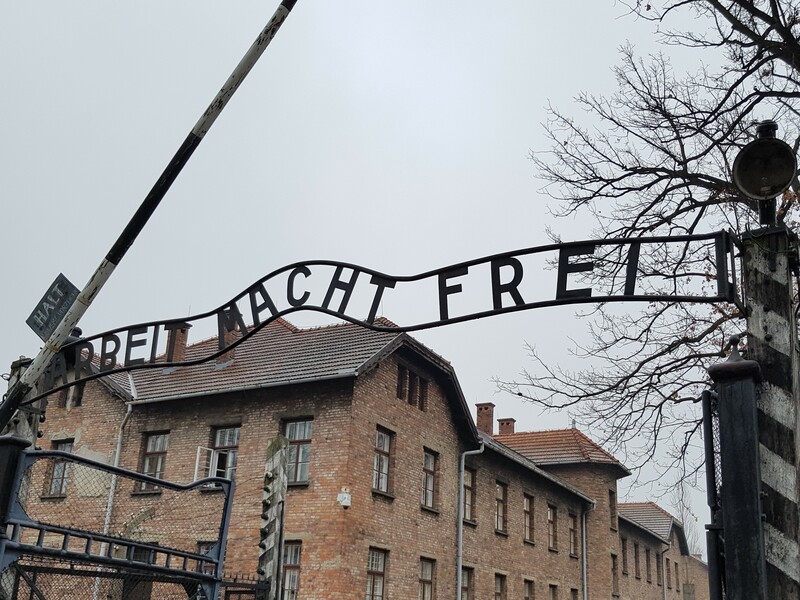 Our tour guide takes us through Auschwitz 1 camp and it starts with the sign above the gate entrance; ARBEIT MACHT FREI – work sets you free. Horrendous irony that meant exactly the opposite for those who came here, a site where the greatest mass murder in history took place, genocide, the holocaust. We are reminded that Auschwitz was originally a Polish Army Camp at the village of Oświęcim, the layout, the barrack blocks remind me of my former RAF sites. But what happened within the electrified fences of this concentration camp was state sponsored slave labour, slow death, starvation, shootings, worked to death, hangings, gassing, suicide, torture, disease, destruction and death. It might be difficult to comprehend the sheer scale of the savage destruction as you are guided around but the barrack blocks now house the exhibits, the stories and the material evidence. Zyklon B canisters used to gas people, mounds of shoes, children’s shoes, baby shoes, suitcases, spectacles, human hair. Early on, before the number got too large, the Nazis kept a record at Auschwitz, the walls are lined with photos of those that were murdered by being worked to death, their name, nationality, birth date, deported date, their death date. The faces of Auschwitz. We’re taken to Block 11, the block used solely to torture, starve, the isolation cells, and where the first attempts to gas using Zyklon B were made. 600 Russian prisoner’s of war and 250 Polish prisoners were crammed into the basement where Zyklon B was released. At 15-20 minutes, not a quick death but an efficient one for Nazi purposes. We walk past the house where the camp commandant Rudolph Hoss lived, the same house where Rudolph Hoss’s wife stayed after he was back in Germany and which his wife described as paradise while on the other side of the fence was exactly the opposite. And not far from where he was hung in 1947. Just a few metres away, the gas chamber and the crematorium. We get to go in, we look up to see the holes where the Zyklon B was dropped through. 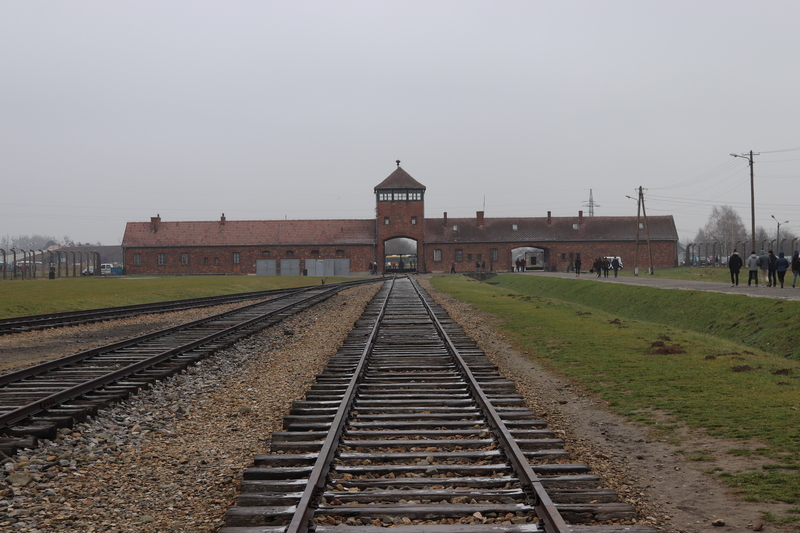 The 2nd part of our tour takes us to Auschwitz camp 2, Birkenau, the death camp, the extermination camp. Birkenau is at the end of the train line, and the very last stop for 900,000 people. Its bleak and barren, the buildings and guard towers punctuate the flat landscape. It was here where people arrived from all over Europe. Arriving off the cattle train, they walk on to the The Ramp. This is where selection took place. The elderly, the infirm, those under 15 walked with their mother walked straight to the gas chamber. They didn’t know they were going, it was orderly. Once there, they stripped for a shower. A shower that never took place. They were gassed, hundreds at a time. After, the Sonderkommando, were forced to clean up the chamber. shave the hair and remove gold fillings and false teeth. Today the gas chamber and crematorium buildings remains as they were found, partially destroyed by the retreating SS. Our last stop is Block 25, the block of death where female prisoners deemed unfit for work were kept until they were sent to the gas chamber. Something to remember as the right wing rhetoric and nationalism that builds up here and across the world where people are rejected by politicians building up walls and fences. Never again. A spine-tingly review – shocking that you speak of reality and not a horror movie. I will certainly visit it at some point. Thank you for going where I might lack the courage. Horrifying. It makes shiver even while reading it. Thank you for visiting and sharing the post. We must always look at it and remember the horrors that mankind can inflict based on hate and also remember to embrace love a more powerful and healing emotion.